Could a major earthquake strike 125th Street? Okay, so it doesn’t pose the same level of threat as California’s San Andreas fault. But Manhattan does have a fault line under layers of schist along Harlem’s main drag. The 125th Street fault “runs from New Jersey to the East River, skirting the northern tip of Central Park and running southeast to Roosevelt Island,” explains a 2002 New York Times article. 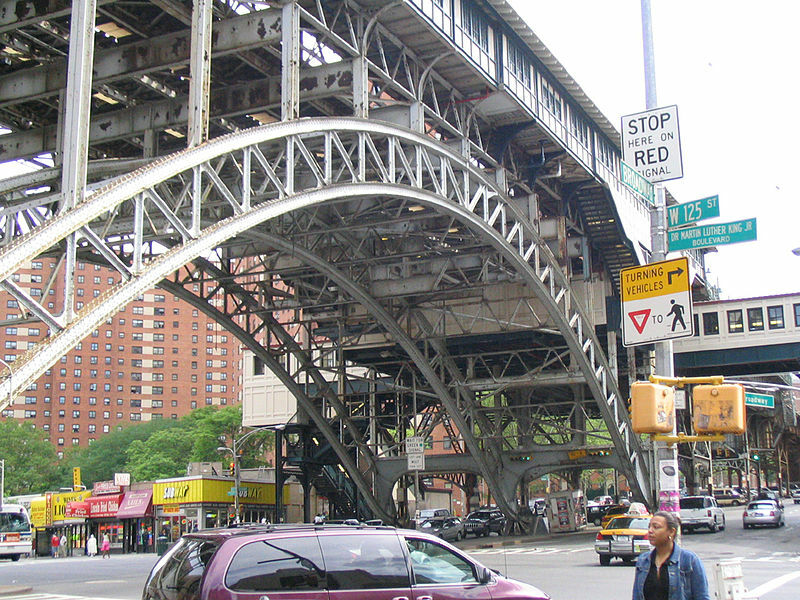 Because of the fault, the 1 train rises above ground and goes over a trestle bridge at 125th Street (left). The fault also forms the natural boundary between Manhattanville and Harlem. And it’s not the only one within city borders. Another fault runs beneath Van Cortlandt Park in the Bronx, and a third under Dyckman Street in Inwood. So how worried should you be about the potential for a serious tremor? Well, the last major city quake happened in 1884 and was centered around Coney Island. “The New York City metro area is susceptible to an earthquake of at least a magnitude of 5.0 once a century,” reported the Daily News in 2011. We might be due for one soon. This entry was posted on June 20, 2013 at 7:00 am and is filed under Bronx and City Island, Disasters and crimes, Transit, Upper Manhattan. You can follow any responses to this entry through the RSS 2.0 feed. You can leave a response, or trackback from your own site. Despite that most sources call it the “125th Street Fault,” I don’t think the fault line follows the length of 125th Street at all, based on the quote you pulled from that Times article and other sources… most are really vague on where exactly it is, but none that are specific make it sound like it actually follows 125th. It starts at 125th on the west side and “obliquely cuts across Upper Manhattan (NW-SE), between 125th Street (west side) and 94th to 96th Streets (east side)” (source:http://dspace.sunyconnect.suny.edu/bitstream/handle/1951/48049/snee.pdf;jsessionid=AFF1BFE37EA89B4C95604431B3925C91?sequence=1) “skirting the northern tip of Central Park” in between. Check out a map. If it goes from W 125 to Central Park North to E94-96 and then Roosevelt Island? If it’s remotely close to being a straight line, it wouldn’t go anywhere near the 125th and 5th street sign you posted. I’d bet more likely that it follows only that westernmost portion of 125th (the slanted part that used to be called “Manhattan Street”) but is likely close to following the lower part of St Nicholas Ave below that, hitting Harlem Meer, and if you get off the 6 train at 103rd you’ll notice that huge hill as it cuts through the lowest edge of East Harlem before hitting the East River. I’m just confused why it’s been named the 125th St Fault at all, given that the westernmost section of 125 was called Manhattan Street until 1920. Was it not discovered until after then? Not named? Not studied? The earthquake we had in 1985, which was a 4.0, was just enough to wake me from my sleep. But when i got up in the morning I thought I had just dreamed it until I watched the morning news. Glad I move to LA last year; no earthquakes here! And here I was feeling complacent to live on the high ground of Morningside Heights, protected from the devastation of hurricane storm surges. I had no idea my neighborhood is perched along a fault line nor the reason the #1 runs above ground at 125th St. Fascinating! He also said that tens of millions of years ago that fault line was an early route of the Hudson River on its way to the Atlantic.